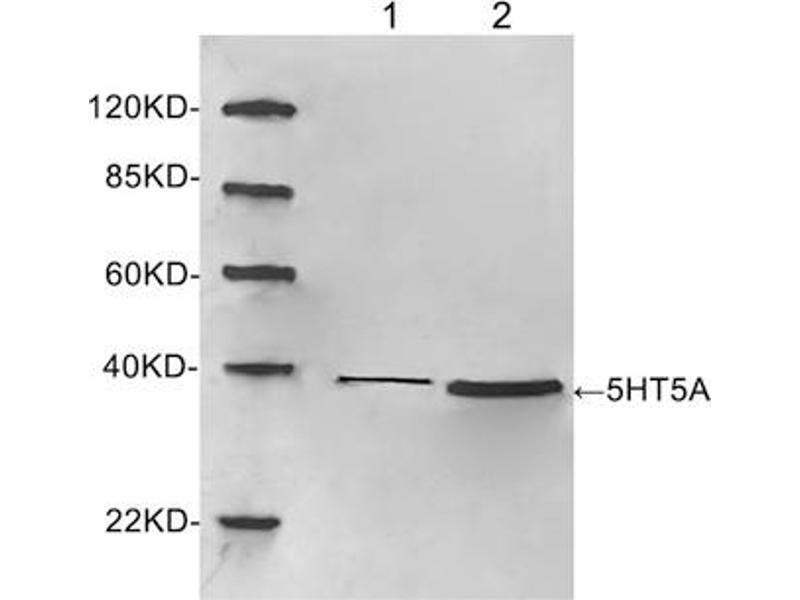 Western blot analysis of lysates using 1 µg/mL Rabbit Anti-5HT5A Polyclonal Antibody (ABIN398747) Lane 1: Hela cell lysateLane 2: Mouse brain tissue lysateThe signal was developed with IRDyeTM 800 Conjugated Goat Anti-Rabbit IgG. 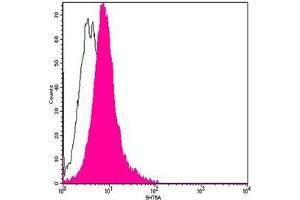 Flow cytometric analysis of Ramos cells using 5HT5A Antibody, pAb, Rabbit (ABIN398747, shaded histogram) or with an isotype control antibody (ABIN398653, open histogram), followed by R-PE conjugated anti-rabbit IgG. 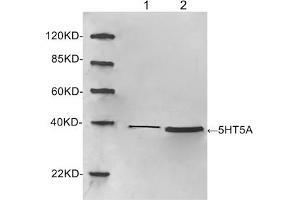 Specificity 5HT3A Antibody, pAb, Rabbit detects endogenous levels of human and mouse 5HT3A protein. Background 5HT5A receptor is a G protein coupled receptor (GPCR) in the serotonin receptor family. HT receptors interact with the neurotransmitter and peripheral signal mediator serotonin. In particular, 5-hydroxytryptamine (5HT) receptors mediate the effects of serotonin in its role as the endogenous ligand and in pharmaceutical and hallucinogenic drugs. In addition, 5HT receptors affect the release and activities of other neurotransmitters such as glutamate, dopamine, and GABA.5HT5A Antibody, pAb, Rabbit is developed in rabbit using a KLH-coupled synthetic peptide derived from the 3rd intracellular domain loop of human 5HT5A Receptor (Swiss Prot: P47898). Application Notes Working concentrations for specific applications should be determined by the investigator. 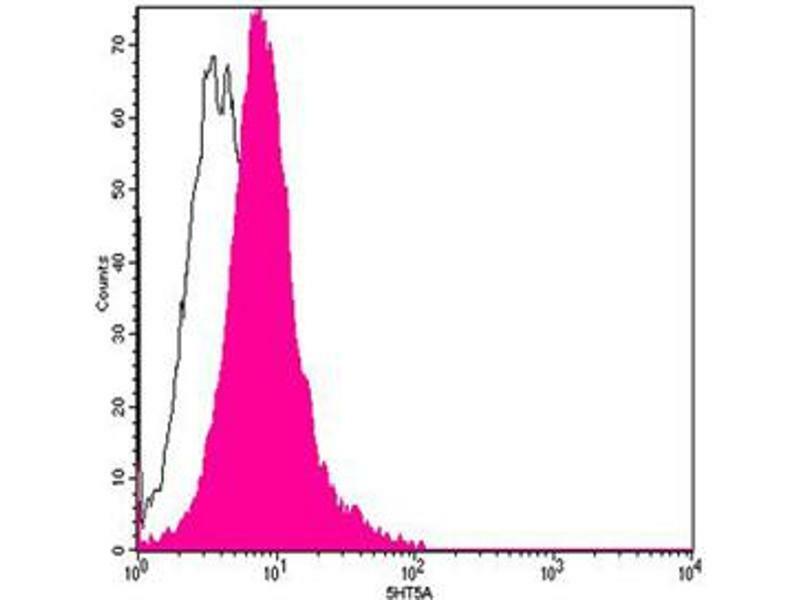 The appropriate concentrations may be affected by secondary antibody affinity, antigen concentration, the sensitivity of the method of detection, temperature, the length of the incubations, and other factors. The suitability of this antibody for applications other than those listed below has not been determined. The following concentration ranges are recommended starting points for this product. Storage Comment The antibody is stable in lyophilized form if stored at -20°C or below. The reconstituted antibody can be stored for 2-3 weeks at 2-8°C. For long term storage, aliquot and store at -20°C or below. Avoid repeated freezing and thawing cycles.